While car companies are charged with continually innovating their technologies and designs, they stand on the shoulders of tradition, more or less, with many echoing the established values and sensibilities of their founders. 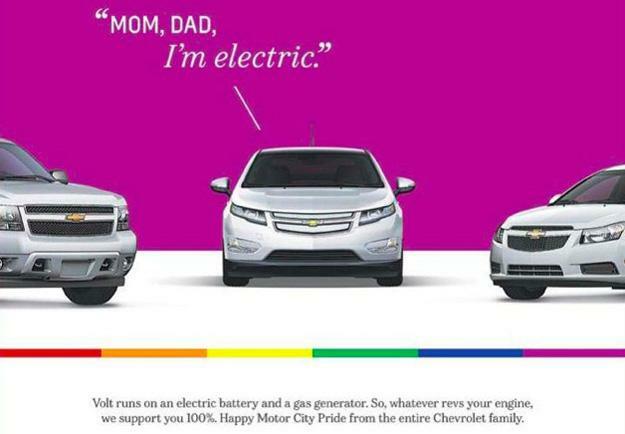 So when a car company comes along in open support of a polarizing subject like homosexuality — as General Motors did with its lighthearted Chevrolet Volt ad at this year’s Motor City Pride event in Detroit — it warrants a degree of respect and acknowledgment. But it isn’t the first time General Motors has targeted the LBGT community; in fact, GM happens to have a long and admirable history of supporting LGBT causes, including Gay Day at the Movie, as well as contributing to the It Gets Better campaign. Of course GM’s latest Volt ad doesn’t mean the company is above taking the more, how shall we put it…scantily-clad route when it comes to advertising (Coachella Volt Recharge Lounge anyone? ), but at the very least it’s encouraging to see a major corporation show its support for a community that has been — and will likely continue to be — marginalized.